Did everyone who survived Thanos' universe-splitting snap in Avengers: Infinity War join Denis Villeneuve's Dune remake? Because the cast is growing bigger with each passing day. 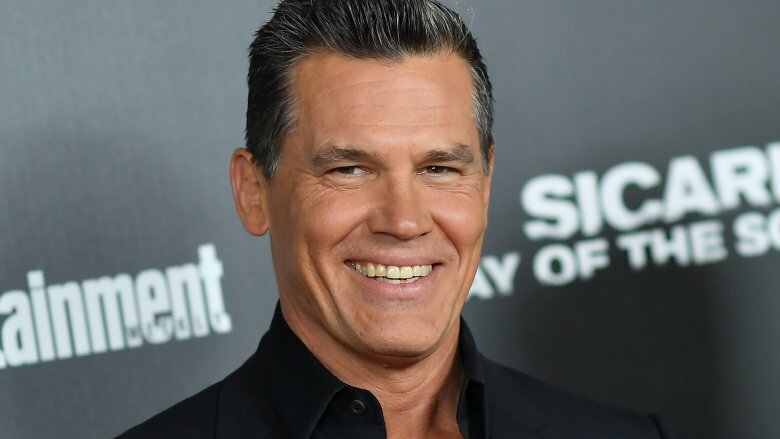 The latest addition to the new Dune movie, which is set up at Legendary, is the man who played the purple-skinned despot himself, Josh Brolin. The Hollywood Reporter confirmed Wednesday that Legendary tapped Brolin to step into the role of Gurney Halleck, a villainous character (surprise, surprise) billed as a "troubadour-swordsman loyal to the family who is instrumental in the wakening of Atreides' cosmic powers, which will start a revolution." The original Dune film from 1984 featured Sir Patrick Stewart as Gurney Halleck, so Brolin has some mighty big shoes to fill. Brolin will act opposite Call Me By Your Name and Beautiful Boy darling Timothée Chalamet, who leads the Dune remake as Paul Atreides, the heir of the Atreides family that rules a planet known as Caladan and eventually oversees Arrakis, otherwise known as Dune, the only known location that produces what's called "spice melange," an addictive drug that has incredible up-shots like prescience and a lengthened lifespan. In the new Dune, Paul is "forced to escape into the desert wastelands and partner with its nomadic tribes." He eventually uses "enhanced mental abilities" to become the ruler of Arrakis, "with the nomads believing he is their messiah," and later "leads an army to overthrow the empire" that betrayed his family. Chalamet grabs the torch from Twin Peaks alum Kyle MacLachlan, who starred as Paul in director David Lynch's Dune of yesteryear. A refresh of the 1984 Dune pic (which bombed at the box office but went on to earn cult classic status) and an adaptation of Frank Herbert's 1965 sci-fi novel of the same name, the Villeneuve-directed feature touts a sterling cast even beyond Brolin and Chalamet. Star Wars franchise breakout Oscar Isaac will play Chalamet's onscreen father, Duke Leto Atreides; Mission: Impossible series actress Rebecca Ferguson will play Lady Jessica, Paul's mother, who "escapes with him into the desert and helps him become a savior in their eyes"; Guardians of the Galaxy franchise star Dave Bautista is on board to play Glossu "Beast" Rabban, the "sadistic nephew" of Baron Vladimir Harkonnen, who governs Arrakis; veteran actor Stellan Skarsgård is set to portray Baron Harkonnen; No Country for Old Men actor Javier Bardem will play Stilgar, "the leader of a tribe that helps Chalamet's character"; and screen icon Charlotte Rampling is poised to take on the role of Reverend Mother Mohiam, "who can divine intentions, suss out lies, and manipulate people's emotional states on behalf of the emperor." Even Zendaya, who is picking up roles like nobody's business, is in talks for Dune, reportedly set to play Chani, an empowered woman with whom Paul shares a deep, intimate connection. Brolin joining the Dune remake should send fans of the original into fits of joy, which is always a good thing when it comes to new takes on old properties. Remakes and reboots don't always strike the right chord — even when their predecessors are largely considered critical failures. Impressing those who love the original is what counts, and adding in even more star power with Brolin to an already glistening cast is just another step on Legendary and Villeneuve's behalf to help bulletproof the Dune remake. Additionally, Brolin's casting in the new Dune movie should excite Marvelites and Deadpool enthusiasts across the globe. Those two fandoms know Brolin as Thanos from Avengers: Infinity War (and the upcoming Avengers: Endgame) and as Cable from Deadpool 2. Drawing in attention from those audiences, ones that span the world and consist of millions upon millions of people, will likely prove incredibly beneficial for the Dune remake; these passionate fans will head out to theaters to see Brolin play yet another baddie, which means more revenue for Legendary. The Dune remake is bound to impress with its stunning cast, and dazzle with its reinvigorated story. Villeneuve previously teased that the film will feel like a grown-up version of Star Wars: "Most of the main ideas of Star Wars are coming from Dune, so it's going to be a challenge to [adapt] this … The ambition is to do the Star Wars movie I never saw. In a way, it's Star Wars for adults. We'll see." Chalamet, a self-professed die-hard fan of Lynch's Dune movie, is also confident the remake will blow everyone away — and won't fall victim to any of the tragedies that often befall films of its kind. "I have read the script and the book and I am so grateful that it's a big movie and yet, there's a real arc to this character," he told IndieWire. "My enthusiasm for the David Lynch version is through the roof. And I got an impression that Denis shares my opinion, too. So working on Dune is like a dream come true … I don't think the film version will suffer from green screen-isms or something, like it's silly or something. It feels like the work is intelligent." Catch Brolin (and the bunch of other bright talents) in the Dune remake when it hits theaters sometime in 2021.